Technology has transformed the way we communicate. We send and receive more and more emails every day. We text. We tweet. We have reduced our communications down to efficient sound bites-and at the same time, many of us seem to know less and less about how to connect. Deeply, profoundly connect. 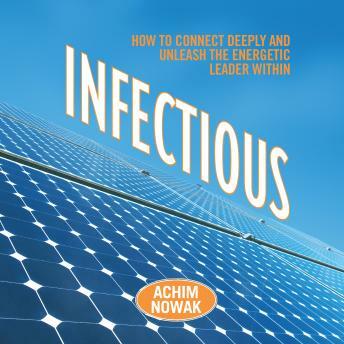 In Infectious, acclaimed performance coach Achim Nowak introduces the reader to his powerful four Levels of Connection. Tested and honed through fifteen years of coaching senior-level executives around the globe, Nowak's techniques instantly transform the skills taught in traditional business communication and NLP programs. People who connect deeply with others connect on four levels: They shape conversations with effortless grace, and they play consciously with the unspoken elements of a connection-personal power, intention, and energy. The result? Infectious connections that accelerate personal success! Infectious offers simple language cues that deepen and shift the art of conversation. It breaks the idea of power into five tangible plugs that we can turn to-and turn on. These plugs recharge the quality of our connection with anyone we meet. It shows how we can clarify our intentions, and how this clarification immediately fosters a more potent connection. Finally, this book demystifies the experience of energy-the deepest of the four levels, and the root of any connection. It looks at how we access our energy. Remove energy blocks. Play with energy and own it. This highly practical book reshapes the hidden forces of a connection into simple, step-by-step actions. Apply the tools of Infectious and generate your own infectious connections!